Available in 9 different grit sizes, ranging from coarse to fine, on plain back or water resistant pressure sensitive adhesive back. Available in 8" diameter discs as a standard, and 12" discs available upon request. Aluminum Oxide and Silicon Carbide Abrasive Cut-Off Wheels are offered for long life, and are affordably priced for various sectioning requirements. All wheels are 9" (228.6 mm) diameter 0.062" (1.6 mm) thick; 1¼" (31mm) arbor. (Silicon/Carbide) is the most common disc. Dialok Diamond Discs consists of a flat, stainless steel backing with sharp, blocky diamond particles electroformed onto the disc. The special hard nickel alloy that is used in Dialok is bonded rigidly and it locks the diamond particles in the disc thus providing fast cutting of all hard materials. The sharp particles cut cleanly with no edge rounding. 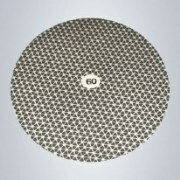 The discs are supplied with pressure sensitive adhesive backing (PSA). 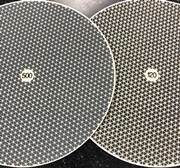 Flexible Diamond Discs will reduce the number of steps in the grinding/polishing process along with a decrease in preparation time. Our Flexible Diamond Discs replace traditional SiC discs for most applications and give a superior finish and perfectly flat specimens. 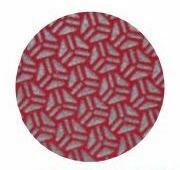 The patterned design minimizes build up of abraded material. They come just PSA backed, but one can add a steel plate backing, as well as a magnetic backing. We are proud to introduce these grinding disks made with silicon carbide grains. They are designed with a flat grain curve that will not flatten after a few applications. They are a good alternative to SiC abrasive paper and SiC grinding foils (films), lasting 50-100 times longer. Grinding disks come with a self-adhesive backing. These new grinding pads will replace 200-300 SiC paper discs saving you not only preparation time, but also money. PremaDisk Flexible Diamond Grinding Discs offer superior surface finishes that are usually only seen in lapping processes. The SM disc is a medium-hard resin bond base for fine grinding and polishing of metals, ceramics and glass. The SH disc is a hard resin bond base for applications where a very sharp edge must be maintained on the workpiece. Both discs increase productivity by combining optimum surface quality, removal rates, and tool life in the same process. Use with a dilution 25:1 with water to cool saw blade or belt during cutting. Made from silicon carbide. Use for cutting blade dressing.